It goes without saying that this is how I've been feeling since Monday. A Red Sox World Series win (yes, Kevin Youklis is one of my favorite players, and has a blog here) and New Job news first thing the next morning. With jobjob ending this Friday and New Job beginning November 12, I decided to go somewhere during my precious, precious week off. I'm going here. My Gastehaus will look out over this very view. I'll be there from Tuesday, November 6, to Sunday, November 12. I'll be on the bridge waving at several points during my time there; I'll let all of you know when. Not that I expect normal people to look at me, but my mom will. Hi mom! I can do it!!!! The yarn is sportweight from Mama Llama, purchase from Woolgirl. The color shifts are subtle, like a Lorna's Laces or Koigu semi-solid, but with almost luminescent sheen. I'm also making something nutty. Check it. It's made from 1.5 pounds of Semi-Solid Blue Faced Leicester Roving from Amy at Spunky Eclectic. Does anyone have a guess? Thanks for the congrats and support about New Job, everyone! and I ain't gonna be treated this way. And I ain't gonna work here no more. Bye bye, jobjojb. Hello New Job. I also finished my Waterfall socks; more details can be found here on the Woolgirl Sock Club blog. Work under Dr. Richard Cory at the Neurosurgery Factory continues. If it weren't for the health insurance, I would run screaming. Does a jobjob have to be so humiliating and abusive? Look how cute she is! She was at Windsor Button in downtown Boston yesterday. Brilliant, yet understated and friendly and smart. And seeing her new pieces knit up, well, I'm very motivated to make MOST of them now. The cropped sweater, called aamu, is one of the sample knits from Berroco volume 1. Looking at these photos today makes me feel as if it is a part of my wardrobe already; it was a struggle to postpone the purchase of the yarn, Berroco Pure Wool Nuance, but I had a special order waiting for me to work on a design I've been thinking about for months. I couldn't leave without the Ultra Alpaca Light for anais, though. Just couldn't. 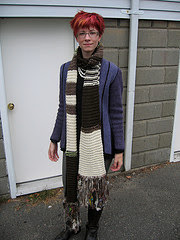 In other news, I've finished up the Entrelac-n-Stripes scarf for unnamed Christmas recipient. I was in no rush to finish this one, it was so much magical fun to make. Entrelac and stripes! Entrelac and stripes! Oh, and yay Red Sox!!! The cats were glad to see me when I returned from a trip to NYC with my mom this weekend. 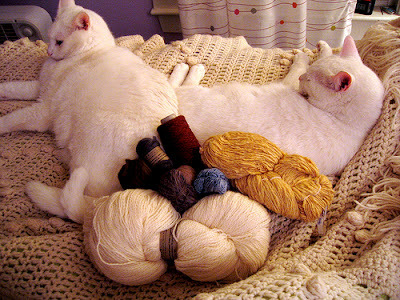 They were so relaxed that they allowed me to pose them with my new yarn and knitting projects. Above is my haul from Habu: some of their soft wool in the approximately 12 epi gauge, some nubbly fine brown wool that they kindly wound double for me, and that golden yellow skein is 2 ounces, approximately 250 yards, of handspun Curricula silk. That is its natural color; it's enchanting. Here is a new jacket design that I began on the bus ride down. It's made of 2 strands of Evilla Vorgarn held together. Yes, I did order from Wollsucht... I made a BIG order to make shipping worthwhile. I know German, so I didn't have any trouble, but I've heard from others that it is also easy to order in English. If anyone in the Boston area wants to order anything, let me know and perhaps we can make one big order. I'm working from both ends of the round, so the varregation of color is subtle. 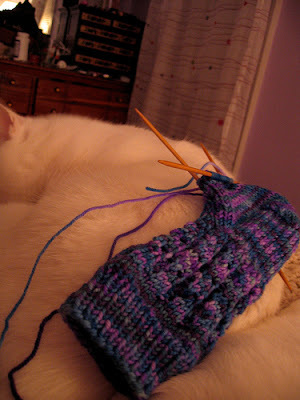 The pattern will be very simple and clean, since the yarn itself is the focus. Finally, I began the Waterfall Socks from my Woolgirl Sock Club membership. 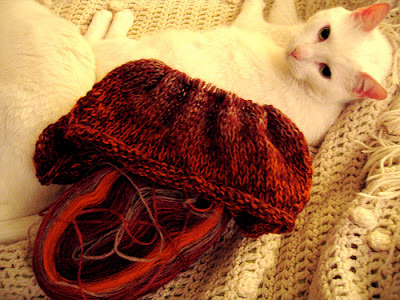 The yarn and design are from Miss Babs, and WOW, is this yarn squooshy. I've used many, many hand-dyed sock yarns, and this one is a standout. Tomorrow: NYC Report, Part II: What Mom and I did for fun. I Run! I'm a Runner! 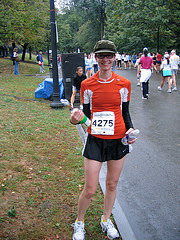 Here I am after the Tufts 10K for Women yesterday: a finish in under 55 minutes! I haven't run a road race since 2001, when I ripped some calf muscles apart training for a marathon, but setting up challenges like this for myself keeps my fitness, and my life in general, interesting. No one is allowed to get too complacent around here! An equally exciting event from this past weekend: A finished Neiman from Gitte! She substituted DK weight wool yarn for both the silk and the wool cotton suggested in the pattern, and is already planning to make another in red and black. If anyone else makes this pattern, please send me photos or links to photos! I'm so impressed with her version, and she told me that it fits perfectly. 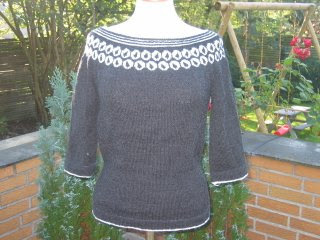 Even though her blog is in Danish, check it out for her lovely knit creations and adorable family. Finally, I completed my bigass scarf Saturday morning, intended as a Christmas present but more and more unlikely to make it to its recipient. It's made of a few skeins of Big Wool and some leftover bits of my own handspun, and fringed with a skein of Ozark Handspun. I only used a little over half the skein of Ozark, and highly recommend it for finishing touches on your projects. I'll probably be making a hat pompom with the rest of my skein, or fringing another scarf. 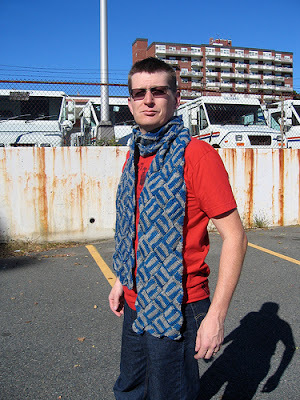 Maybe a gift scarf. Maybe. Here's a hat I finished for my grandma's Christmas present. The pattern is a modified Odessa, with no beads and a different gauge and with the decreases spaced differently, so, well, I suppose it's just a spiral hat, a la Odessa, or le Odessa, for those of you who may be familiar with the question of Davidic authorship of some of the Psalms in the Bible. I made it from less than one skein of The Fibre Company's Savannah, purchased at Purl Soho. The softness of the fibers and richness of the colors are stunning. Well, how could you believe I'd take you seriously? Just remember you'll only be the boss so long as you pay my wage! This is what I did this weekend (aside from working on learning the breaststroke at the YMCA, watching The War on PBS and other crafty pursuits). It's part of a costume for my friend Sara's 4-year-old niece, who has insisted on being Toto for Halloween this year. In her mind, Toto is a vague, amorphous, grey, furry creature (remember, this is the mind of a 4-year-old). I used some grey fur I purchased at Sew-Low Fabrics, lined it with some Dorothy-esque gingham from my Nana's fabric stash, and attached brown velvet ribbon ties. There was weaving, yes there was. This is a table loom that my weaving teacher has provided for me to use, not my actual loom, which will make an appearance on this blog soon. In progress is a sampler, not meant to be anything at all. I'll begin planning out my first goal-oriented project tomorrow night, and it will involve Habu textiles to be purchased while I'm in NYC with my mom in two weeks. To round out the Fiber Arts weekend, here's some Spunky Eclectic roving in Chocolate Covered Cherries spun up as a chunky two-ply. Soon it will be in the mail to a knitting friend.